A research team led by Dr. Takashi Mochizuki at Project Team for Risk Information on Climate Change, the Japan Agency for Marine-Science and Technology (JAMSTEC: Asahiko Taira, President) performed multiyear climate prediction with initialization on a basis of four-dimensional variational (4D-Var) data assimilation*1 on JAMSTEC's supercomputer, Earth Simulator. It was the first application of the 4D-Var data assimilation system developed by JAMSTEC in the field of multiyear climate prediction. These climate prediction experiments over the last 50 years (hindcasts) significantly demonstrated enhancement of predictive skills for multiyear climate changes, in particular, in the Northwestern Pacific. To enhance accuracy of multiyear climate prediction, it is indispensable to suitably determine initial values (initialization) by incorporating various observational data of atmosphere and ocean into climate models (data assimilation*2). However, it is not easy to integrate ocean and atmosphere observation data while keeping the dynamical self-consistency as a coupled climate state that has been accumulated with various techniques. For this reason, initialization for multiyear climate prediction so far has been limited to using some oceanic observation data only. In this study, the 4D-Var approach enabled direct assimilation of time trajectory of slow climate changes in observational datasets of both ocean and atmosphere. It led to determine initial values more suitably for multiyear prediction. These achievements should help compile a dataset of ocean environment prediction for multiyear in a more sophisticated manner. Such prediction could be utilized also for applied research areas such as fishery and marine resources. This study was supported by Program for Risk Information on Climate Change (SOUSEI) and Social Implementation Program on Climate Change Adaptation Technology (SI-CAT) by Ministry of Education, Culture, Sports, Science and Technology, and also JSPS KAKENHI Grant Number 26247079 and 26800253. The above results were posted on Geophysical Research Letters issued by American Geophysical Union on April 14, 2016 (JST). It is an advanced technique to optimally integrate observational data and numerical models using variational principle. Unlike this study's approach, it is not still common to apply it to coupled climate simulations. As it can reproduce consistent ocean and atmosphere (here it means three-dimensional) time series (i.e. four dimensional) in a dynamic manner, it is receiving increased attentions in the field of climate change prediction as one of the most promising methods. This approach can compile a newly integrated dataset by incorporating both ocean and atmosphere data into prediction models based on optimization theories. In other words, by using numerical models, this approach can dynamically interpolate discrete observations in space and time. It is a mathematical process of incorporating observational data into numerical models. In this study, in particular, it refers to the synthesis of discrete observational records into a continuous dataset by using numerical models. Data assimilation is usually used to incorporate actual observational data into numerical models as it offers higher accuracy in prediction by presenting more suitable initial values for ocean and atmospheric environments. Figure 1. Observed and modeled time series of (a) global-mean surface air temperature anomalies (annual means) and (b) wintertime sea level pressure anomalies (four-year means) around the Aleutian Islands (area averages over 35N-65N and 160E-140W). 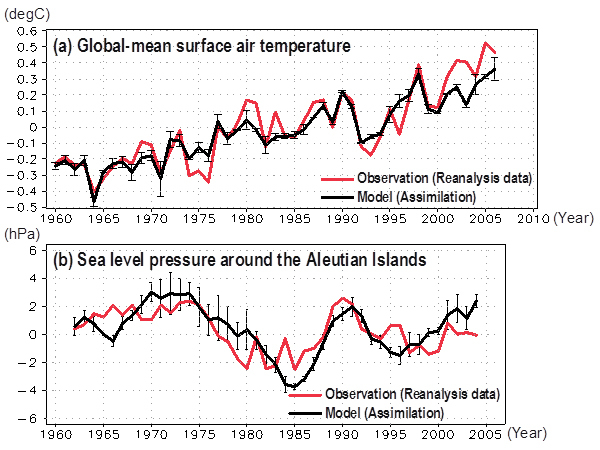 Both model results (assimilation) well reproduce the observed climate changes. (Red) Observation using NCEP* (National Centers for Environmental Prediction) reanalysis dataset as proxy. (Black) Model results (47 assimilations). The vertical bars indicate ranges of uncertainty estimated by ensemble calculations. Figure 2. Spatial patterns of ocean-atmosphere variations closely related to variations in sea level pressure around the Aleutian Islands (correlations of sea surface height and linear regressions of sea level pressure). For sea level pressure variations around the Aleutian Islands (refer to the lower panel of Figure 1), the above shows variation patterns that are likely to appear simultaneously (upper panels); and those that are likely to appear three years later (lower panels). Contours represent variations in sea level pressure (interval of 0.25 hPa). Shaded areas indicate statically significant variations in sea surface height. 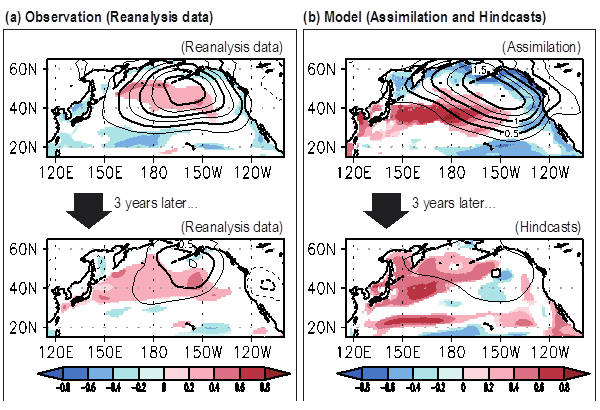 Overall, the model results (hindcasts) well reproduce the observed sea surface height changes over the Northwestern Pacific, through dynamical response of the extratropical ocean to the initial conditions (assimilations) of sea level pressure around the Aleutian Islands. (a) Observation using NCEP reanalysis dataset and ESTOC (Estimated State of Global Ocean for Climate Research) ocean reanalysis dataset by JAMSTEC as proxy.